John NU3E and I planned to hike into a fire tower located on Hunter Mtn about one mile south of the Hunter Ski Area in the Catskills of NY. The mountain is 4060’ and commands a 360-deg view of that area. The hike has about a 2200’ elevation gain over 2 miles so it’s a fairly “rigorous” hike. On the Friday before, the weatherman was predicting severe clear and temps in the mid-80s. 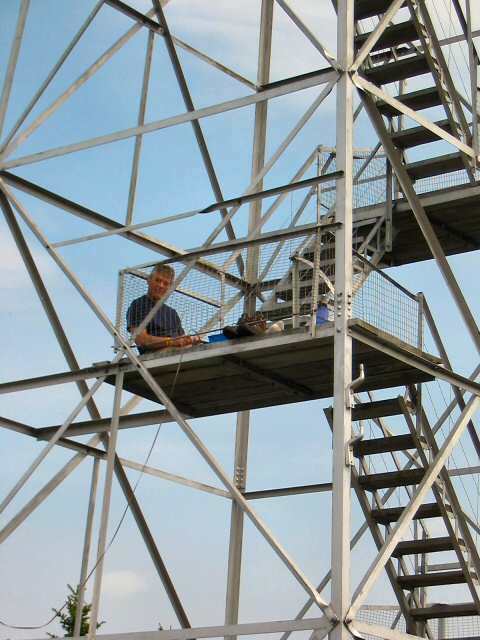 Consequently we were expecting a good hike and an exemplary day for QRP radio operating, especially by using the 50’ tower for at least one end of the antenna! Of course, this outing like all the previous ones, will generate a lot of new stories! And we weren’t disappointed!! 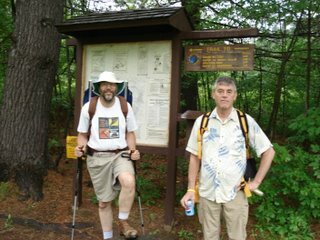 John met me at my house where we parked his vehicle and carpooled the 90 miles north to the trailhead in the Catskills. John later described what happened first: “As we approached the NY Catskills the skies grew darker and darker. Then rain commenced and grew heavier and heavier. Hams on the local 2m repeaters began discussing the verystrange, unexpected weather. On the trail, hikers who had prepared for a hot, sunny day were soaking wet.” We couldn’t believe it! 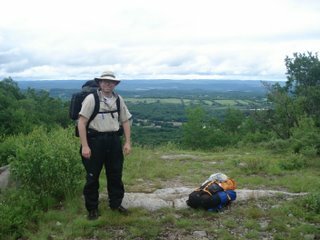 And of course I’ve been shrugging off my new moniker of “rain man” based on a similar occurrence a couple of weeks earlier on the AT in New Jersey! Well, the climb up to the Fire Tower was really a nice hike. The trail was good although somewhat steep and there were only a “few showers” on the way up. By the time we reached the top, the rain showers were replaced by the sun and gusty wind but the temps were in the 70’s. What we didn’t bargain for was the insects! Thousands, it seemed, of swarming little gnats, impervious to 100% DEET, and hungry for human flesh. 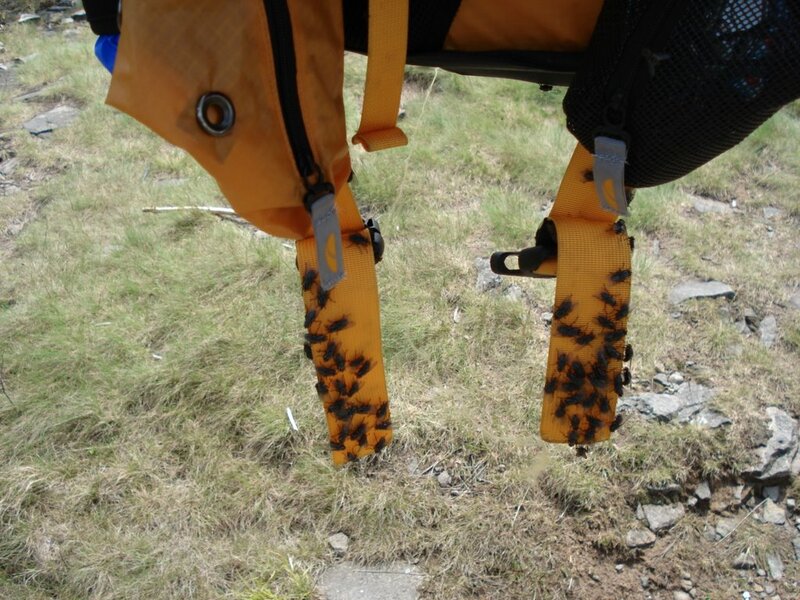 Nasty little biting buggers that draw little whelts and seemed to crawl up shirt sleeves…. 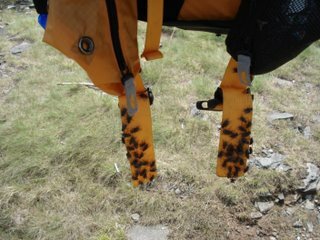 But that was not the worst, however, since we were also plagued by big, HUGE, flies that swarmed around any food, sugar, sweat, anything!! Since there was a decent wind, I climbed the tower and set up the K1 at the 20’ level or so. This tactic seemed to work for a couple of hours until the wind died down. John setup over near the edge of the heavy woods in the shade which seemed to work for a similar period. We persevered like real Polar Bears! We each struggled for QRP contacts….it seemed that the band conditions weren’t even cooperating! We previously had this hike scheduled for May but weather the Thursday before was rainy and the predictions were for more of the same for the weekend. None of us really wanted to get drenched so we choose to cancel and reschedule for June. As it turned out, the weatherman was wrong and that May weekend turned out to be quite nice. Oh, well we thought, so much for the weather predictions! John and I shuttled a vehicle to the end of the hike and then drove back to Catfish Fire Tower to meet Ed and begin our hike. We left about 11 am under partly cloudy skies, moderate humidity and temps in the low 70s. Our goal that day was to hike about 10 miles to either Rattlesnake Ridge or the Brinks Road shelter. If the weather looked promising, we were going to camp out on the ridge since it would be a better location for radio propagation and certainly less humid than down at the heavily-treed shelter location. But…..we were watching small thunderstorms build all afternoon and the weather forecast now was for “occasional showers” during the evening. We got to Rattlesnake about 5 pm and the steady rain started. We had several small rain showers earlier in the day but they always quickly blew through. Not with this shower…we could see it to the west and the clouds looked ominous. We were tired and were looking forward to getting into camp and our packs off. “Just a half mile or so,” I assured Ed and John. Shortly we pulled into the heavily-wooded Brinks Shelter, unloaded our packs, and scouted the area for “air hooks” to hang our antennas. Priorities first! What we noticed first was the generally soggy ground conditions due to days of rainy weather and the current showers only added to the muddiness. The mosquitoes were congregating in the shelter so we elected to pitch our tents for protection. Dinner followed shortly thereafter and the rain continued steadily, buffered somewhat by the heavy foliage from maple, oak, and other deciduous trees. Ed’s feet and shoes were soaked and John’s knee was bothering him. Hopefully a good nights rest will help. We retired to the tents about 8 pm to work some radio on 20, 30, and 40m. I was making contacts on 20m and John on 30m and 40m. Little did I know the important qso John was making with K0RU for a wife-rescue the next morning. You can read John’s story at http://ae5x.com/at2.htm for details and how Morse code and a good ham operator certainly saved John’s day! It rained all night! At times the heavy rain pounding on my tent woke me in the night. I was dry but I wondered how the other guys were doing? Morning came and the rain stopped for now. We ate quickly and John told us that he arranged for his wife to pick him up in Culvers Gap which was 3 miles north on the trail. Ed’s feet, socks, boots, tent and sleeping bag were soaked and he also joined John. We got to the Gyps Tavern about 11:30am or so with the last mile in another rain shower. A quick cheeseburger and fries made a big attitude adjustment for me. It was still about 10 or 11 miles more to the Mishapahcong Shelter where we were going to meet Glen N1KN who was going to hike in about a mile from a nearby parking area and then hike north the 5 miles to High Point on Sunday. I left Ed and John about 12:30, feeling fine and focused on the mileage ahead and “just getting there!” I climbed the 800 or so feet to the ridge where Culvers Lake Fire Tower was located. Unfortunately I mis-read a trail blaze and took a right on the old trail withthe relocated AT trail going left. 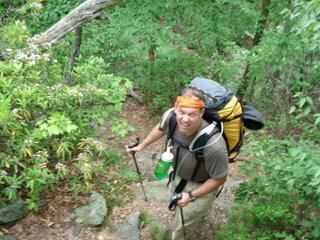 After following white blazes, 800’ of elevation drop, and a mile later I realized my mistake and turned around to make the climb back to my “last good location” on the AT. Many miles on the AT have been relocated over the years and the “old trails” still exist, white blazes and all. It was surprisingly easy to make this mistake! Now I was at least an hour behind my schedule. I redoubled my efforts on the relatively flat ridge and increased my pace to better than 3 mph. I arrived at the Mishapahcong Shelter at 4:30 pm. Glen was there, having just arrived about 45 minutes earlier after hiking the 5 miles south from High Point. He was unable to overnight park his car nearby so made the trek south to the shelter. I quickly brought Glen up to date with the “news” of Ed and John’s situation. We stayed in the Shelter as the rain showers were still continuing but got our antennas up, then had dinner. As I watched John unload his pack it became apparent that John is a very organized person….everything had a bag and the bags were color-coded for quick access. Now this is in comparison to my “one bag”, my backpack! Everything I have goes in with some semblance of priority but inevitably what I need is always at the bottom. Not so with John…everything has its place. I was amazed and amused. Surely there was a trailname here…yes, BAGMAN! Glen good naturedly laughed at himself and quickly adopted the moniker! We both operated our K1’s. I was on 30m and John tried 40m. Band conditions were terrible and we struggled for a few qsos. No fun! It continued to rain occasionally, dark set, and we both crawled into our sleeping bags. The stalled weather front responsible for the incessant rains finally moved east, dropping overnight temps into the 40’s. I had my “lightweight” sleeping bag and was cold during the night….I finally covered up with my poncho and then stayed warm. Morning came early and we both got up around 6 am or so. The rain stopped and the skys were partly cloudy. We quickly ate, packed up our antennas and camping gear and hit the trail about 8 am or so. I walked at Glen’s pace and we had a good time talking with day hikers and section hikers on the AT. We met “Hansel and Gretel”, trailnames for an elderly (late-60’s or so) German couple who had flown over just to section hike the AT for a couple of weeks! Their English was very good and we had an enjoyable conversation for 10 minutes or so. We got into High Point about 12:30pm and unloaded our stuff into Glen’s car. We then drove into the Park to find John who was up at the High Point Monument working CW on the bands. We traded stories for 20 minutes or so then John gave me a ride back to my pickup at Catfish Fire Tower. Another hike completed, more stories, pictures, and memorable field radio times! QRP operating from the AT makes the hike more enjoyable especially for the wonderful qsos with folks who invariably exclaim “YOUR DOING WHAT! !” and then spend the next 20 mins or so telling us their story of operating from the field! !